ElectronicLocal: It Just Got a Lot Better - My New Tools. It Just Got a Lot Better - My New Tools. I thought the beginning of 2016 would be a good time to share where I am now in my trading. Let me be clear, the basis has not changed. I trade inside out trades by trading the pullbacks in the trens as well as outside in trqades fading overbought and oversold conditions, all in a Market Profile context. Lets start by talking about where Pete Steidlmayer is now. Here. 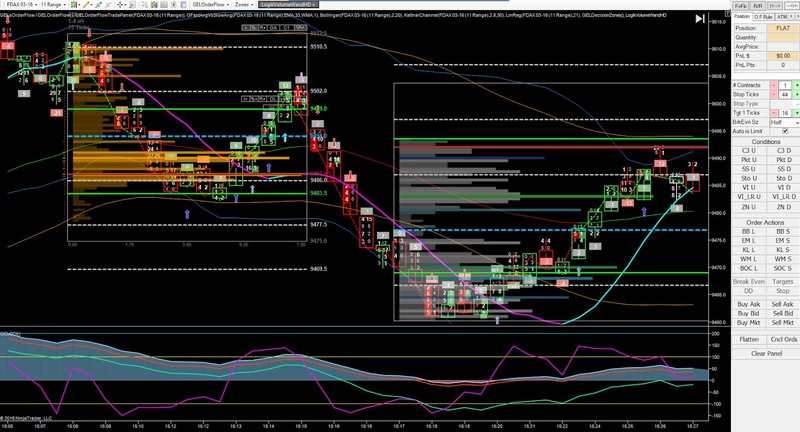 Pete talks about trading the swings between accummulation and distribution. He tracks VOLUME. Now that actual live volume is available, he says that TPOs are outmoded. While I don't totally agree with that as I believe that Market Profile provides both support and resistance information as well as a big picture information of where value is moving, I do agree that we now are able to rtrack volume on a much more granular scale. I tried using Pete's Volume Strips that he refers to in the video when they first became available, but I did not "see" the order flow clearly at all. I then tried to use Pete's Cap32 software and had a guide with me for a week. Sadly, this did not add anything to my seeing order flow. Perhaps it was just me. What began to provide me with more information was firstly cumulative volume delta and then MarketDelta's Volume Imbalance charts. Finally, the order flow was becoming visible. So lets talk a few specifics. The VP identifies whether a pullback is a probable entry point or not. The VP also allows me to use tighter and better stops. To achieve this, I use multiple VPs on my chart as the swings develop. The inside the bar information you see allows me to fine tune entries and to better identify exits. The final piece is the buttons on the right I call GEL. These buttons allow me to hybrid trade and use specific rules in specific context whwre a set of pressed buttons are only valid for the particular trade I am attempting. They reset to zero after the trade is entered. The Volume Profile is available from PureLogic. I'll provide more info on this great tool in subsequent posts. You can see the Volume Profile on any bars you select and shows, for that selection, VA, VAL VAH, POC, VWAP and Standard Deviations plus a lot more.You can buy it here. I have written this day trading blog since October 2009 when I started teach one of my daughters how to trade. I have recently released an eBook: Trading Order Flow in a Market Profile Context that shows my trading methodology using the latest technology. I have also been involved in alogrithmic trading since the 1980s when I met both Bob Pardo and David Aronson, two of the most historically influential people in retail algo trading. I taught a course on algo trading a few years ago and have now re-invented how I create and trade algos with the latest technology incorporating order flow. I'm teaching my youngest daughter to trade. She's a 25-year old IT professional who came to me a couple of months ago and said, "Dad, I want to learn to trade. I’m tired of working so hard making other people lots of money. Do you think I can do what you do?". I've been a successful trader for over 30 years, yet I’ve always discouraged my kids from becoming traders. It's a hard way to make a consistent living unless you have strong discipline and focus. Then I thought, she has a career to fall back on if she doesn’t succeed, which often happens. Plus she was very insistent, (a good trait for a trader) so I said OK.
Was this a weak moment of a dad being wrapped around a daughter's finger? So this blog will be our trading journey and journal. The good, bad and everything in between. I'll start by posting a huge amount of trading and background information. So if you're following this blog start with the oldest posts. As things get moving, I'll be adding questions, answers and comments. Twitter will provide Tweets of trading information and I'll even try videos to get the difficult trading concepts and ideas across. We should end up with an all in one reference and "how to" of my trading methodology.